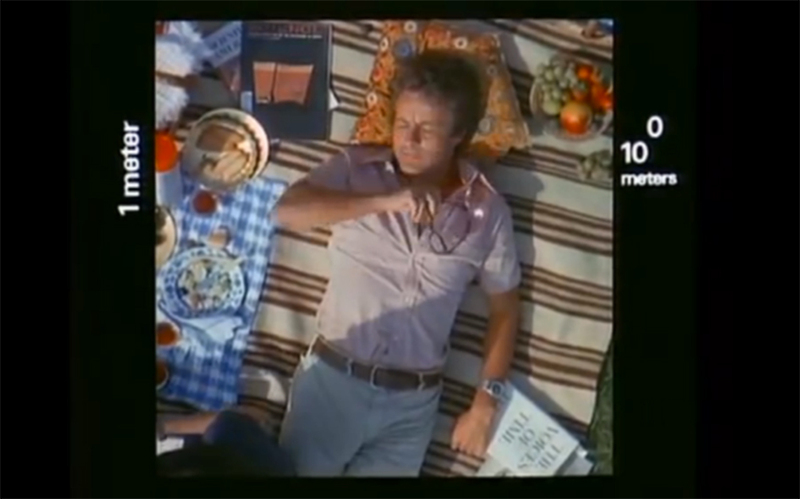 Scale frame, degree zero: Powers of Ten,1968. ©2014 Eames Office LLC. Today we add different visualization technologies and different relationships to the zoom. In lieu of a method like splicing, we have multiple and shifting practices, and complex sites where scales of influence coalesce. Toll plaza approaches over the century, collage. All images courtesy of Jordan Geiger unless otherwise noted. Consider the lowly, increasingly unstaffed tollbooth, and more, its entire peri-urban landscape—what we might just coin a “Phantom Tollbooth Plaza.” In 1961, author Norton Juster and illustrator Jules Feiffer published the novel The Phantom Tollbooth, a children’s book in which the eponymous roadside shed and architectural work of mini-infrastructure was recast as a gateway to another world. Something like a latter-day rabbit hole for the America that had been borne of midcentury automotive development, or a black hole on the asphalt, the humble tollbooth was suddenly imbued with magical powers to transport the book’s protagonist to a parallel universe. This book reached enduring popularity with youth of its time and in the decades thereafter, likely embedding itself in the cultural consciousness of a generation now long since grown: people such as myself. In hindsight, it seems to have been an ingenious vehicle for the story, not in its timelessness but rather in its fleeting timeliness; these sheds had their roots in the Middle Ages, but their particular formation with highways, cars, not to mention the growing coordination of interstate law enforcement, was an utterly fresh and foreign appearance. The tollbooth seemed otherworldly even before the story imagined it as a portal to another world, and the ubiquitous toll collectors—often experienced as a disembodied outstretched hand—already ghostly in their impersonality. 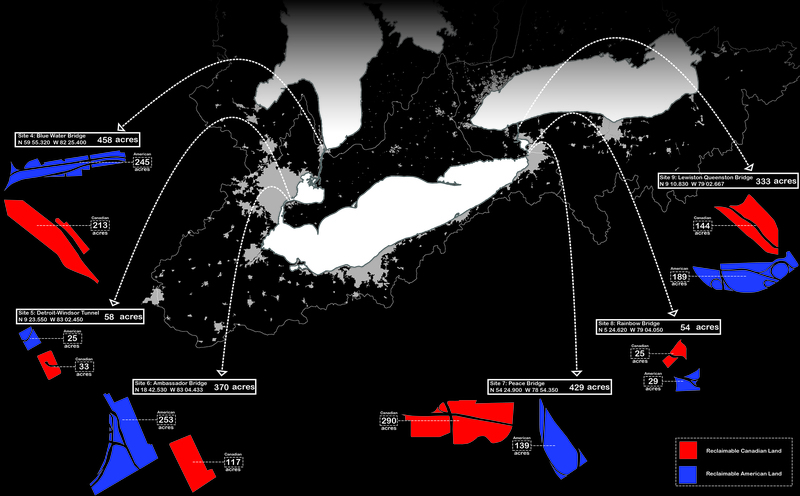 Land areas at the largest twenty-four border crossing plaza sites around the Great Lakes alone total 2,903.85 acres, or more than 4.5 square miles. By comparison, this is more than one-tenth the land area of Buffalo (40.6 square miles). They also dwarf some of North America’s largest urban parks (Toronto’s High Park is 398 acres, Central Park is 843 acres, Boston’s Emerald Necklace is 1,100 acres, and San Francisco’s Golden Gate Park is 1,017 acres, to name a few). Toll crossings and pass control stations are last century’s familiar polyps in road development, the ubiquitous spots where two lanes expand to ten. Inverse diagrams of automotive speed on the ground, these add up to surprisingly vast tracts of sacrificial lands at the gateways of cities and, indeed, of nations. The entire conurbation that goes without sarcasm under the rubric “plaza” has nonetheless performed as a vacuum on social interactions and relations between urban center and periphery. As such, they are also something like social inversions of plazas of yore. 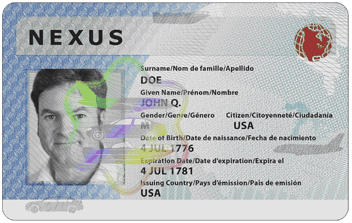 NEXUS (frequent traveler program) ID card. Image: Wikimedia. Inside a two-story, beige brick building. : not merely into the city but to transitional zones at the hazy boundaries of cities and even nations, where the ecological and social fallout of last century’s infrastructure can be rethought and remade with new digitally inflected public space interactions. Thanks to the gradual introduction of radio-frequency identification (RFID) tags, NEXUS cards, and other electronics for toll payment and border services, tollbooths grow derelict, and these lands are now open to being rethought. These amount to a mammoth public zone where the toll plaza once served: a Phantom Tollbooth Plaza. How (not) to experiment in a volatile, uncertain, complex and ambiguous world.—are suggestive of new forms of shared space, urban boundary and mobility to enter the city. These are the subject of a series of ongoing case studies I have initiated around the Great Lakes. In order to grasp the opportunities for mobility at the Phantom Tollbooth Plaza, it must be understood as an emergent form, no longer a mere infrastructural object but now the space of a Very Large Organization. Today, human–computer interactions in the built environment are marked by the rapid development of Very Large Organizations (VLOs), a term I have elsewhere proposed to describe a phenomenon of our day, as the built environments of work, public assembly, agriculture, incarceration, trade, travel, education, even death join global financial and communications networks.1 The planning and implementation for VLOs command unprecedented resources – logistics, capital and new orders of population magnitude. 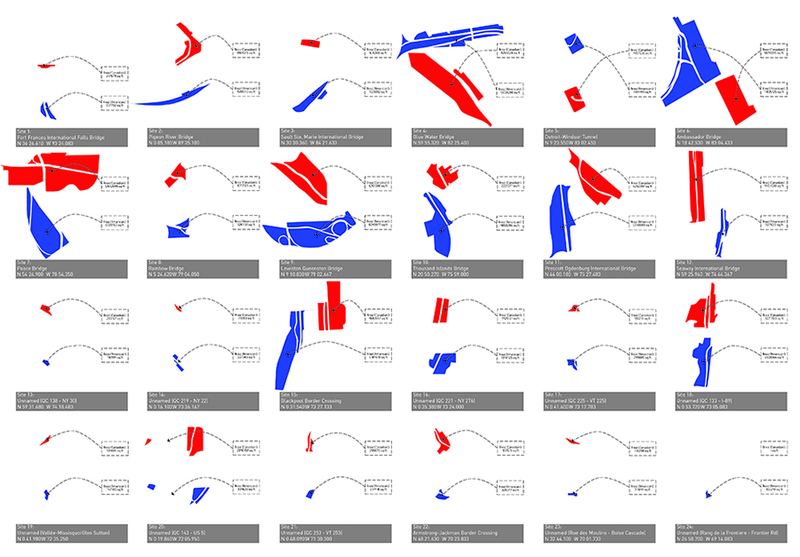 To function, they must coordinate these resources to accommodate volatile shifts with spatial and computational stability. Adaptability is at the crux of dealing with diverse users or publics and unprecedented technical, cultural, social, and ecological challenges; and it is where control can give way to engagement and participation. Annual personal vehicle border crossings at the Great Lakes sites. 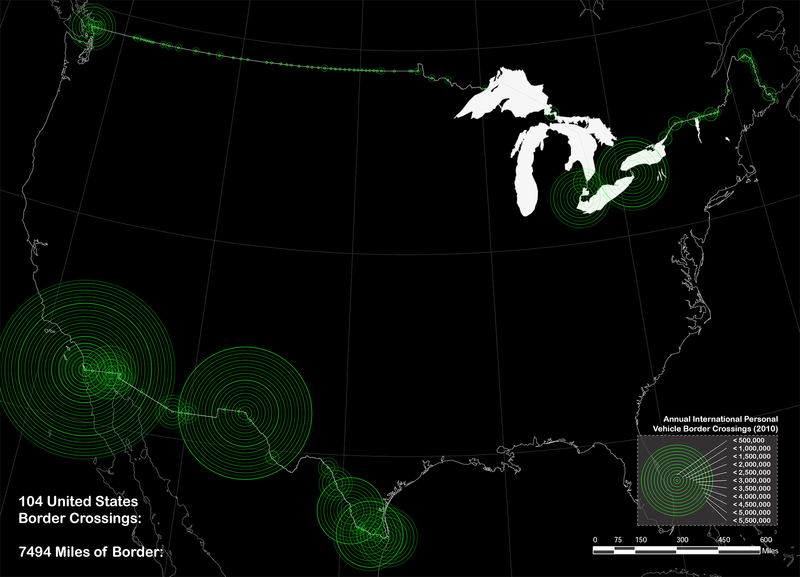 Personal vehicle border crossings, cross-referenced with land areas and CO2 emissions. At places around the U.S./Canadian border, the Phantom Tollbooth Plaza’s ongoing mutation as a VLO is marked by recent political and technological ripples at the Peace Bridge. Located where the city of Buffalo meets Fort Erie, Ontario, across the Niagara River, this site has many salient characteristics of U.S./Canadian land crossings today. It handles heavy but fluctuating traffic across a land and water border, sometimes concentrating plumes of air pollution from idling engines right above the airspace of one of the Great Lakes. In contrast with the U.S./Mexico border, these stations are many and grow increasingly streamlined in their handling of automotive traffic, because economic and political relations encourage the easy passage of regular commuters and therefore a highly porous national border. Until 2009, crossing was permitted with an ordinary driver’s license check. Today, that same crossing requires a passport control, but its cumbersome and time-consuming process has in turn given way to the advent and increasing subscribership of NEXUS cards: electronically read, biometrically referenced ID for prescreened regular commuters in both countries.3 Between RFID toll collection and facial recognition used with NEXUS cards for border control, the plaza grows “un-tolled”—unprogrammed and left to tell or host new stories. 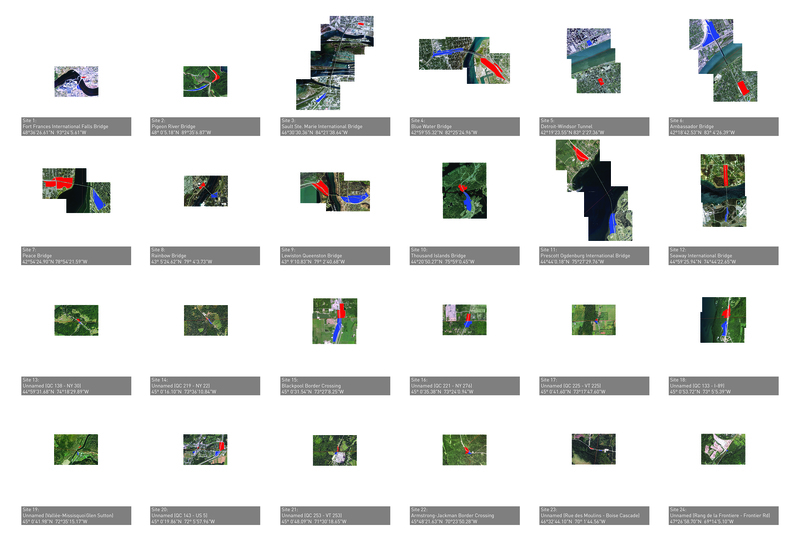 24-site survey using satellite imagery. 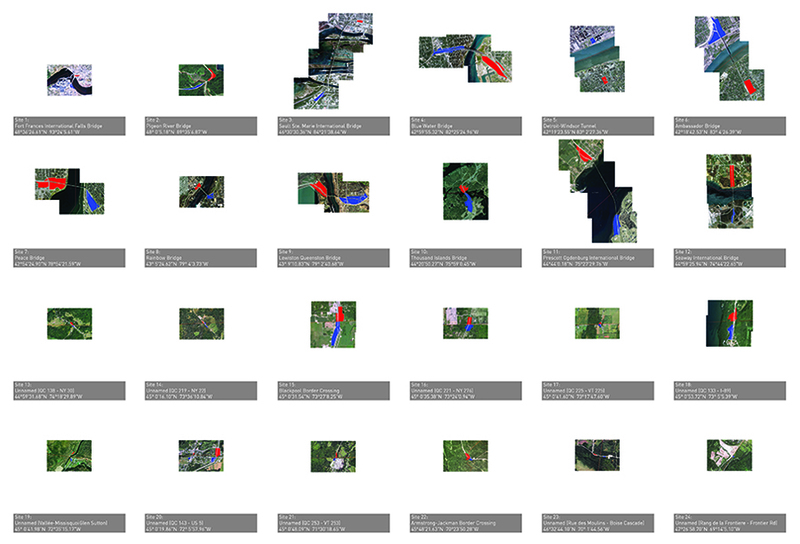 24-site survey quantified by area. Uncontrolling weather control. to satisfy demands for security yet speed passage for regular border commuters. This is because the protocols and technologies remain in transition. Just as RFID transponders obviate tollbooths, RFIDs themselves may soon vanish too: in Germany, for example, truckers are already charged tolls perpetually by GPS. The Phantom Tollbooth Plaza is therefore a new peri-urban and bi-national zone for new forms of public interaction. Its sites must be taken as suggestive of new forms of shared space, urban boundary and mobility to enter the city for anyone in transit in the thickened leftover spaces between borders. This brings us to grapple with understanding roles of technology across scales: from RFID transponder to car to city to the potentials for a new bi-national zone, one that redresses the same tangle of personal, urban, and supranational interactions that are already rife with potential at such fringe conditions today. 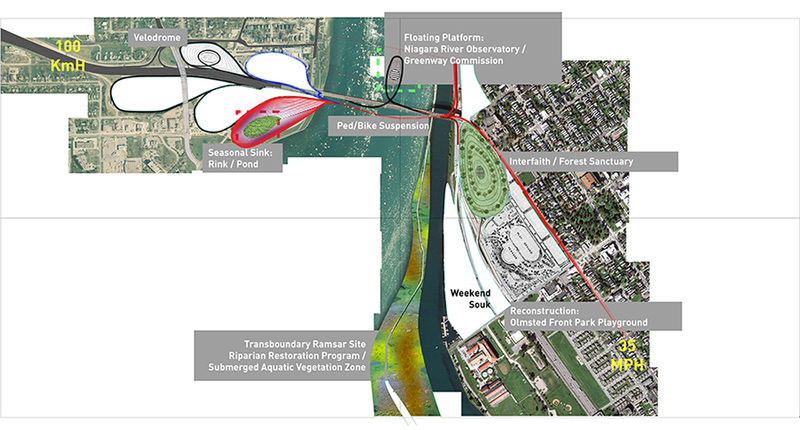 Recent battles over the Peace Bridge hold a great resolution in the potential to create something previously unimaginable: a bi-national “grey zone.”4 The greyness of the zone is constituted in its liminal status, as it exists in transit, straddling borders, both architecture and landscape, and often across land and water. In this proposal, the zone is a salvaged remnant and made greyer, capturing a permanently transitory character in its physical and legal makeup but also serving fleeting social encounters in which visitors are also grey, not defined by their passport. Overview of site density and traffic volume, zoomed out to the national scale and revealing contrasting driver experiences and correlated smog production. 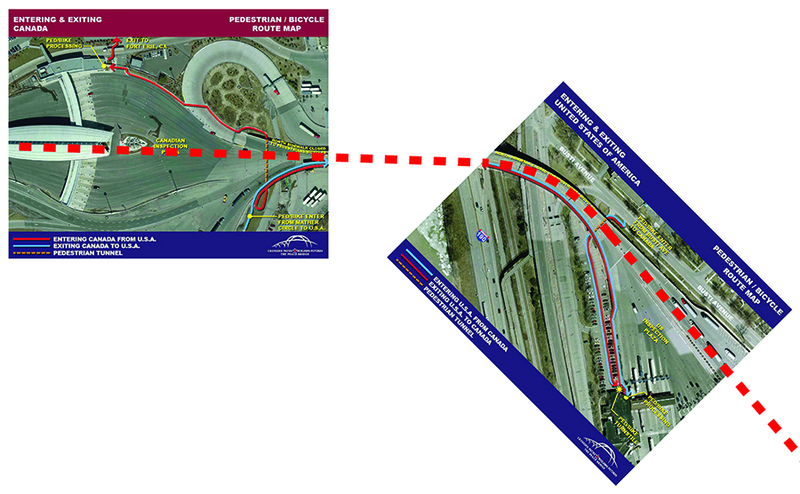 Site photos from the New York State–based, bi-nationally mandated Buffalo and Fort Erie Public Bridge Authority, showing nonvehicular areas of movement at the two passport control and toll collection plazas. 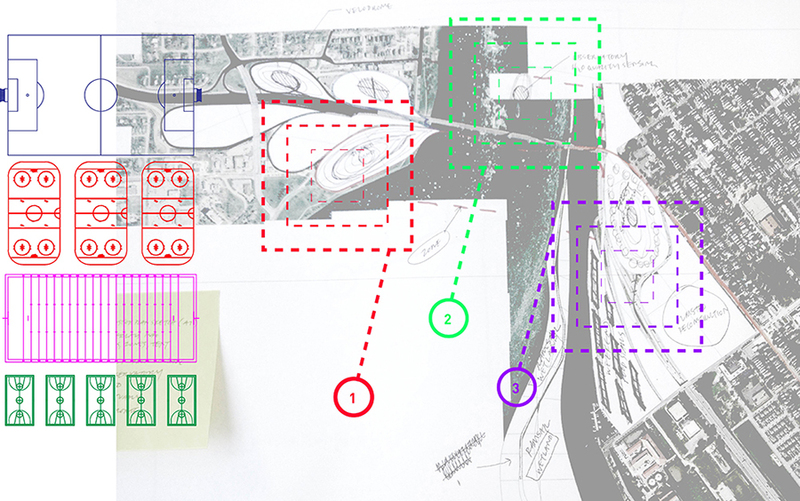 Process sketches for areas of zoom, various dimensional standards and spaces liberated for redevelopment by decommissioned passport control and toll collection plazas. Yet the changes at the toll plaza gesture toward the promise of new interactions that can occur at the same spaces they have liberated. 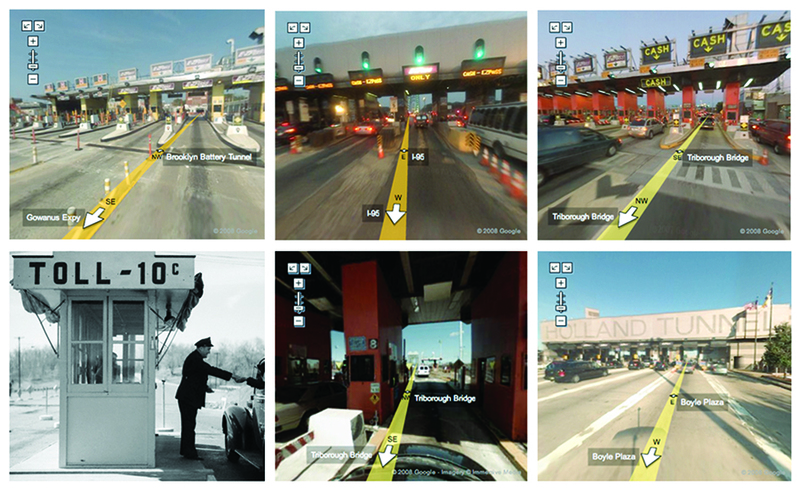 If recognition and identity are now conditioned by biometrics, then the architecture and landscape of the Phantom Tollbooth Plaza should likewise become a social space at the interstitial zone between countries, one that lets visitors meet directly and in play with the assistance of biometric indicators.8 These need not answer to the same end goals as homeland security, though. Rather, play and interpersonal engagement should govern interactions in the zone. Can the ground itself grow responsive to one’s weight, to gait? Could it warm or light passages to others, or to views and rest areas? Could the touch of a palm on a handrail initiate a soundscape?9 How might an engagement with nature, with data, and with other people mark the zone between borders? These are some questions that are implicit in the redevelopment of the zone. 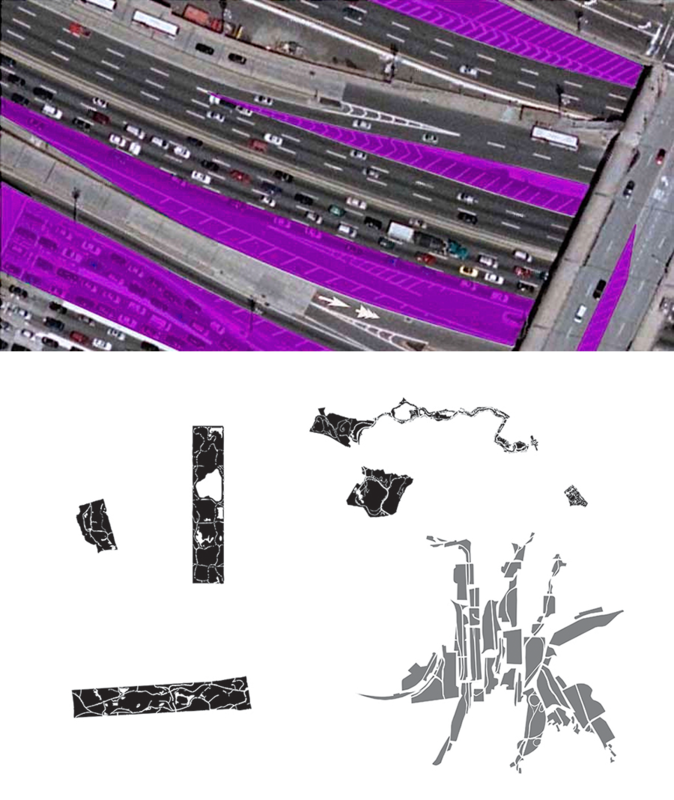 Progress plan for the bi-national grey zone: re-streaming vehicular traffic, supporting additional loops of movement for pedestrian, wheelchair, and bicycle movement, and programming captured spaces otherwise left as leftover spaces within turning radii. With redevelopment, the Phantom Tollbooth Plaza can become both a site of ecological remediation and a field of slow pedestrians rather than idling engines. Ground surfaces for ecological remediation can host plantings that consume carbon oxides and that sequester particulate matter; or serve the existing binational initiatives already working on projects for such goals. Drivers can have a space between lands where they can stop, leave their car, and meet one another in a bikeable or walkable zone that was previously most forbidding, yet most tempting to explore for its diverse conditions. A new form of sociality can be prototyped here within the zone, marked by and engaged with the digital controls that enabled its very creation. These sorts of changes carry enormous spatial and experiential implications. They promise that boundaries will no longer be about toll plazas as gateways (points) but rather about perpetual sensing on the roads (lines). With a switch from RFID to GPS tracking, the very spatial and temporal performances of mobility are poised to shift further. Borders will no longer appear as lines but as zones and meshes—as durations of space and time to be occupied by diverse publics. This perpetuity, this duration, touches all issues at play here: movement, banking records, ecological fallout, and place-based identity. “Duration” is at the heart of this momentous opportunity, and it is an aspect to a new notion of the calm at hand. If Mark Weiser’s notion of calm technology10 was predicated on invisibility and non-intrusiveness, this one is rather about a regular and conscious engagement—or disengagement—with technology’s place in mobility. Old practices like war driving, used to chalk wireless hotspots and associated information right onto the streets, and many other practices have proceeded from similar impulses to make networks and also their liabilities for privacy visible. These include activist and artistic practices that foreground placement of CCTV cameras, détourned use of bluejacking, and more. But in all these, the space and time of the digital encounter is punctual or linear; it can be chalked as a spot, or traced as a line. 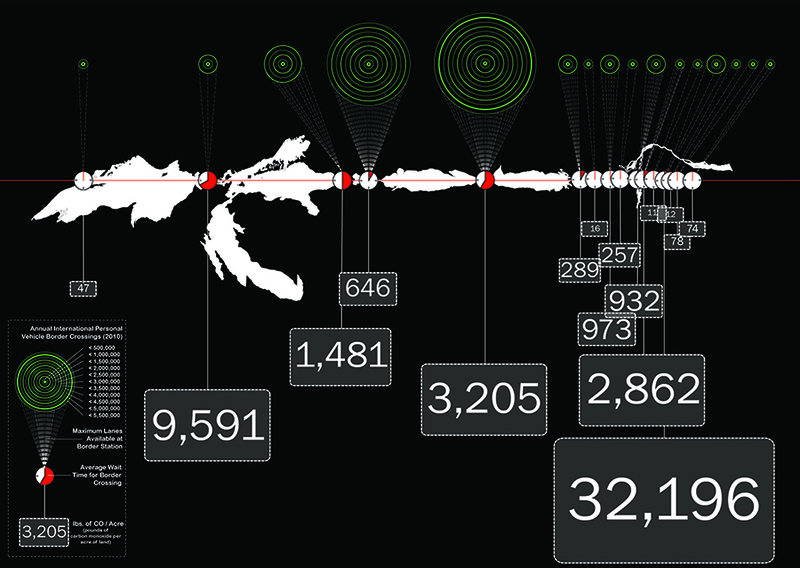 Duration-based experiences of sensing and tracking, on the other hand, prompts us to confront, get aware of, and also grow used to how mobility, freedom, and privacy now correlate—at the borders. 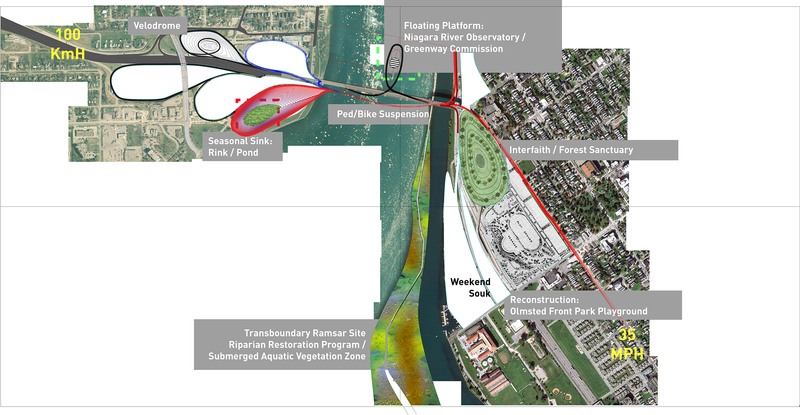 The following are very in-progress snapshots from a proposal at the Peace Bridge border crossing as a sort of latter-day agora—built of surfaces supportive of athletic, artistic, spiritual, and political life of the city—on the Niagara. 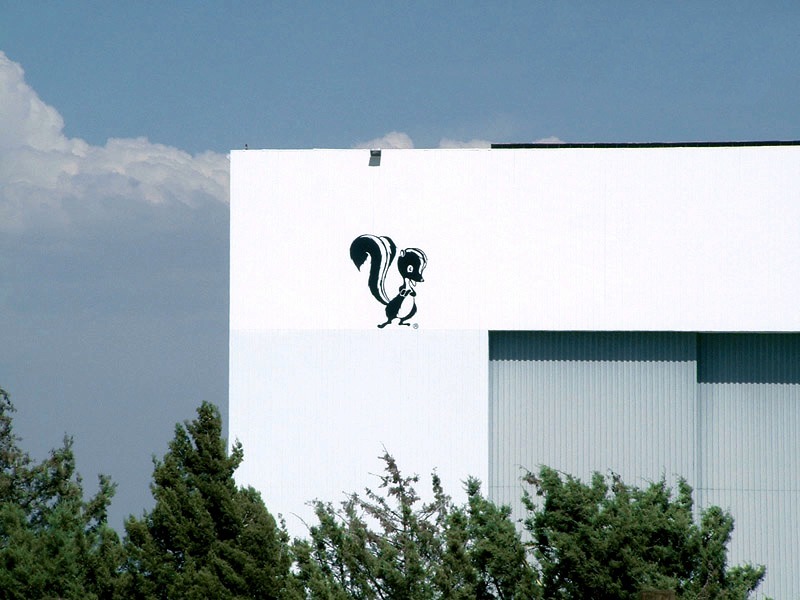 The proposal serves several inquiries around building now at the confluence and many scales of global legal, ecological, technological, and material forces.11 It aspires to a sort of applied research, but reclaimed from a damaging legacy of Thatcherism that relied on a narrow, free-market notion of application. The research and design practices are tentative and multiple: while bridging architectural methods with research into law, finance, and computer science, projects like Niagora also hope to skirt some of the pitfalls of DARism and to gradually use the work—as a state agent (literally, I am a state employee) to advocate for opening the discussion of these spaces and their transformation. As an ongoing inquiry, Niagora has a clear sense of test, a multiple sense of subjects, and a stitching, seeking sense of practices. Niagara River Observatory, floating on pontoons and dangling water sensing equipment within the flow of international waters. 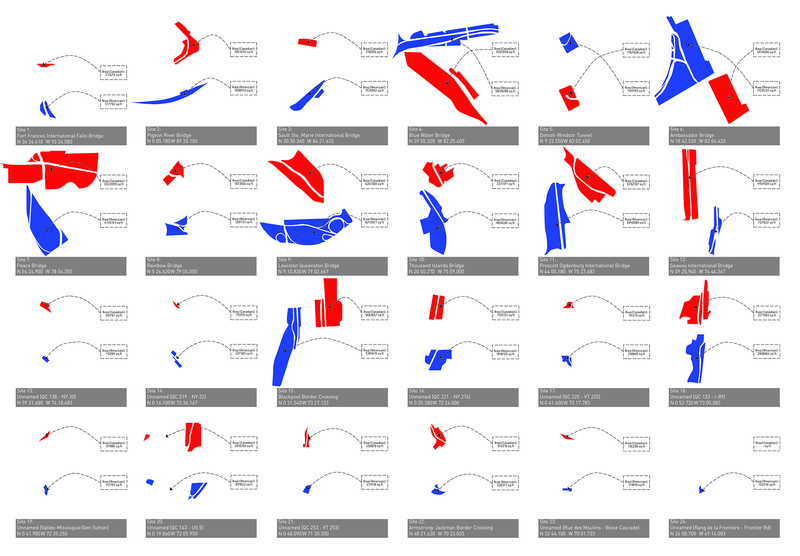 Access and details of dimensions, radii, and curbs are predicated on changed needs around attention with the proliferation of driverless vehicles. Lighting is left to provide for interactions yet to be determined. The sink or spiral drops down below Lake Erie’s horizon and rises back up as a track routine or as an accessible path to summertime pond access and wintertime ice skating. 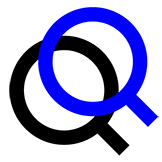 Some surfaces of movement may provide shielding from tracking, or otherwise support the suspended state of the grey zone as it provides for a stateless and changing set of agora-like programs. Jordan Geiger is an architect and educator. His research, writing, and design work cross architecture and human computer interaction at large shifts in scale and engaging social, legal, and ecological forces on the built environment. At the University at Buffalo, he is Assistant Professor of Architecture and a member of the Center for Architecture and Situated Technologies (CAST). This project has its origins in ideas first developed in “B,T, & Me,” a collaboration with Shona Kitchen and Derek Lindner, and was developed with project assistants Daniel Barry and David Heaton.